This is a recipe that I found in last year’s Slimming World calendar and whilst it is totally ‘syn’ free, it is also a yummy low pro points recipe (and you get a giant portion!!!). My OH loves this as it tastes nothing like a diet recipe and it is absolutely delicious! I haven’t made many changes to the original recipe other than to add an element or portion control (which SW sadly lacks) and lots of lime as its my fav! Spray a large frying pan with 1Kal spray and fry the pork for 4-5 minutes (or until its cooked). Transfer to a plate. In the same pan add the prawns and fry for 2-3 minutes (if frozen add a little water) and then transfer to the plate with the pork (I’ve made it without the prawns a few times too and it’s just as nice!). Spray the pan with 1 KAL again and over a lower heat, fry the garlic and ginger for about a minute (you might want to add a little water so it doesn’t stick to the pan).Then stir in the onion, spring onion and stir fry vegetables and chilli and cook until all the veg are nice and softened. Add the curry powder and carry on cooking for another minute then add the soy sauce, salt and pepper and stir fry for another minute. Add the pork and prawns back in at this point and warm through. Then push everything to one side and pour the egg in, let sit for a second and then mix to scramble. Once the egg is cooked mix everything together and squeeze in a the juice of a quarter of the lime. Add your beansprouts at this point if you are having them. Meanwhile cook your noodles in another pan (I just splash a little water in a frying pan and heat them up and sprinkle with a little soy, curry powder and lime). 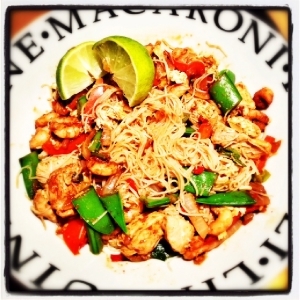 Pop the noodles in your bowl, top with your stir fry mix and finish with a large squirt of lime! It’s lovely with the lime so I always do a few extra quarters of lime to serve on the plate. Ok … this is certainly on the list to do … the BF loves a Singapore Chow Mein and so do I but it’s SO pointy! I thought it was one of those dishes I’d just have to avoid a bit again you’ve come to the rescue. I’m guessing that on Flex I can add a chicken breast for 0 points?? I’ll report back at the weekend as to how it went down!! That counts as an astounding success. I made this on Wednesday and Mark devoured and hasn’t stopped talking about it since. I added Chicken Breast and with a bit of tweaking and adding enough veg to up it to 3 portions it was a very reasonable 7 points on Flex. Looks like this is going to be a Bond St regular.